Special Price £2,987.75 excl. £3,585.30 incl. Limited Time Offer: 50% OFF for existing users when upgrading to Vectorworks 2019 with Get Current! Please Note: We may need to quote VSS pricing pro rata for users with a current VSS subscription. Contact us for a quote. Vectorworks Designer is the premier software for design professionals in the Architecture, Landscape, and Entertainment industries. Vectorworks Designer provides a competitive edge by offering a large set of design tools - integrating the technology of every Vectorworks product into a single, intuitive interface. Whether you need to draft, model, or present, Vectorworks Designer is the ultimate solution for the professional who needs it all. What is Vectorworks Service Select (VSS)? For further information on the current VSS offers and to check if you're eligible, click here. With Vectorworks Designer, you can create Building Information Models (BIM) without changing your preferred design process. Whether you’re looking to streamline costs, analyse materials, increase your energy efficiency, or just create world-class designs, the Vectorworks Designer solution is an efficient way to introduce BIM capabilities into your workflow. Enjoy the robust and flexible capabilities of BIM with ease of design, great documentation, and intelligent tools. An advanced suite of Parasolid-based solids and NURBS surface tools lets you create any shape and easily explore geometry. Plus, with graphical scripting tools, subdivision surface modelling, point cloud support, you can create any shape and easily explore geometry. Vectorworks' intuitive interface lets you design from any 3D view using modes in modelling tools that automatically infer working planes as you move your cursor, and enjoy the superior quality that allows you to manipulate your model with ease. More accurate object information and better snapping make drawing in 3D easy. Import or export a wide array of image files. Publish your design for inclusion in your firm’s marketing materials or website. Get on the cutting edge of collaborative digital practices, exchanging 2D, 3D, Building and Site Information Modelling (BIM/SIM) data and models for numerous multidisciplinary, multi-platform design workflows, as well as sending models to CAD/CAM machines, CNC routers, and 3D printers. Enable multiple designers to work concurrently on the same Vectorworks Designer file with Vectorworks' Project Sharing feature. Project Sharing provides a flexible way to manage productive workflows for even the most complicated project. Plus, the software lets you create, model, present, and develop your designs easily and precisely with just one application. Vectorworks Designer offers precision drafting tools, intelligent objects for building, detailing, MEP, furniture, millwork, machine parts, and annotations, plus thousands of free symbols from leading building product companies. Batch print drawing sets or export them as multipage PDFs at full or reduced sized. Plus, use the exclusive sketch rendering technology to change hard-lined drawings into soft, hand-sketched illustrations, blurring the line between clear, accurate technical documentation and compelling presentations. Vectorworks Designer provides an efficient way to introduce Site Information Modelling (SIM) capabilities into your workflow. The program’s tools will help you analyse your design for area, volume, slope, cut/fill, and other data such as water flow and sun/shade. Scan in planting plans and trace over them with ease. Or, simply enter your field measurements. Use the property line tool to define a site’s boundaries and setbacks. Plus, building tools and site objects easily document existing structures and site conditions. In addition, you can use the program’s drawing, modelling, and 2D and 3D graphics capabilities to create compelling presentations. Vectorworks Designer software gives designers in the entertainment industry an edge to advance their ideas from concept through completion. The extensive libraries of signature brand lighting are complemented by best-in-class documentation tools, so users can quickly create light plots, automate paperwork, and visualise your design in rendered 3D views. 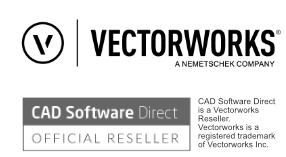 Vectorworks Service Select is a subscription agreement that provides customers with several added benefits, including immediate receipt of product releases, the best pricing, predictable budgets, priority technical support, VIP access to downloads, easy account management, and access to a growing library of on-demand learning tutorials. You’ll also have exclusive access to Vectorwork Cloud Services, as well as their mobile apps. A dedicated OpenGL 2.1 compatible graphics card with 4GB of VRAM or more.